Weather forecasters huh! They mention that it’s going to rain ‘later’and there is bright sunshine, they tell us that there will be heavy snow showers over the weekend and neither day provides an opportunity to use the snow shovel you went out and got especially. 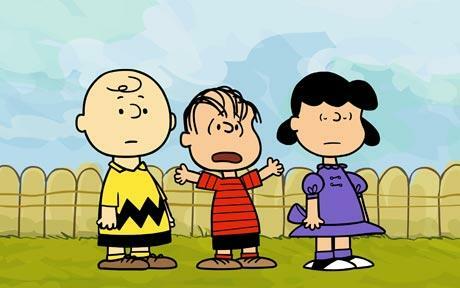 Let’s face it weather forecasters just aren’t all that good at what they do, which is sad because when they tell us about the big one, Global Warming we find it so very hard to listen with a straight face! 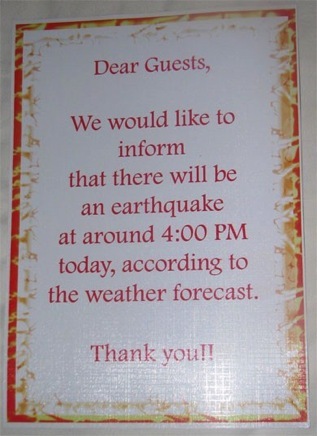 So how would you respond to this weather forecast posted in an hotel reception in Burma, pack a plastic mac and smile? 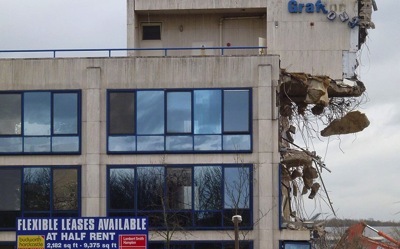 Unfortunately there was an earthquake that day, I wonder if anyone was prepared? Doubt it don’t you! It’s a wonderful place to start and end a business on the same day! Passing other motorists on African roads! 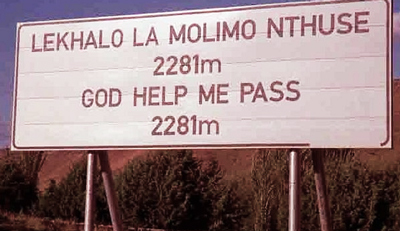 As this sign demonstrates sometimes you need an extra bit of help when passing another motorist on African roads! 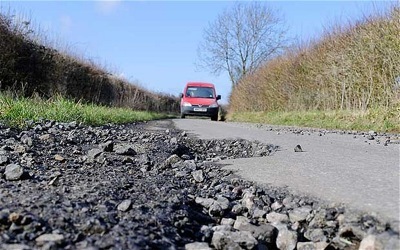 As far as I know the British are now developing roads that have a similar design and build quality to African roads. 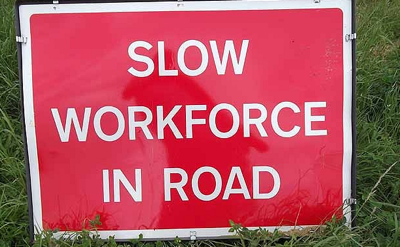 Good luck passing anything on these new super roads which I believe the British Chancellor has designated “toll roads” because they take there toll on you, your car and if you are really unlucky your life! Well done Chancellor toll roads should see Britain out of the recession! 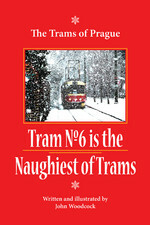 Recently the results of a photo competition run by the Sunday Times, the British Tourist Board and the people who don’t do a very good job of looking after the railway network were announced and while the winner of the main prize produced a stunning picture of Corfe Castle in Dorset very near to where this Cat lived a long while ago I have to say, the entrant that this Cat liked best of all was from a much younger person. 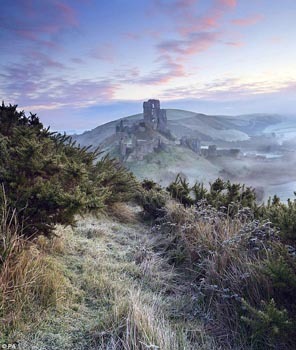 Don’t get me wrong – Corfe Castle, Dorset, taken by Antony Spencer is an excellent photograph it has everything that was needed to win a British landscape photo competition and it also proves that Mr. Spencer takes his art very serious and gets up very early in the morning and makes meticulous plans to achieve stunning results. On the other paw “Breakfast View,” by Taliesin Coombes from Cardiff who won the ‘Young Landscape Photographer of the Year’ competition demonstrates everything that is great about young people he wanted to win a prize, he didn’t want to get up early in the morning and most of all he wanted a full English breakfast, toast and a cup of tea and the result is perfection. 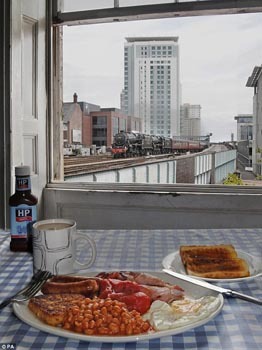 One thing I would ask is where is the pepper and salt because I don’t like the brown Sauce (HP)? But what and idea! What a picture! 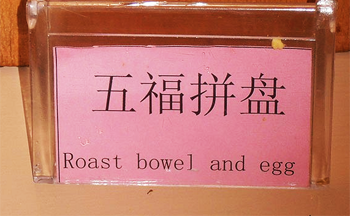 And what a nice tasty breakfast! 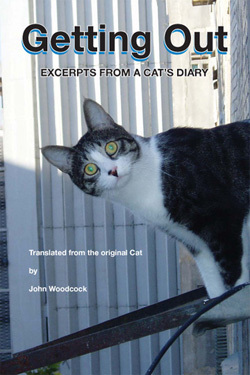 You know I have a feeling that if I had submitted the photograph on the cover of my book I would have won first prize, especially if there was a category for “amazingly talented daredevil Cats” – maybe next year, what do you think? In the meantime if you need to get a copy of my wonderful photograph then happily you can get one or more here at Amazon.com or of course you can always get a signed copy of my marvellous book from my www.thecatsdiary.com.